It always startles us how fast it can go from chilly to hot where we live. The small golden period of “just right” is usually only a few weeks, and then we’re looking at triple digit days! If you’re like us and looking for ways to stretch out your cold weather wardrobes, we’ve got two easy no-sew ideas today. First take those long sleeve sweaters and tees and turn them into the perfect Summer Tee. Cut the sleeve off at about 3/4th of the way down, roll twice and you’re done! With crazy growth spurts, we usually find that the boys jeans are getting a little too short in the length even though they just fine in the waist! No need to get rid of them, simply turn them into some cut-off shorts! Tip: for the single fold cut-off, mark the knee caps of the jeans while your kiddo is wearing them for the most precise cut. If you just want a standard frayed cut-off, make your mark just above the knee before cutting. Do you guys have any great tips for extending winter wardrobes, we’d love to hear! Also a reminder, Little Giraffe has an exclusive discount code for Small Fry readers! It expires 5.20.2013. Use “H2TFLOVE13” at check out for 15% off apparel! I love the stripes! I wish we had that sweatshirt! Think a dark gray with a little skull face on it would be cute cut? I have a little target sweatshirt that I think I may try! the cut-offs is such a great idea, especially since my little girl has all but ruined the knees of her pants this spring! i might make her some bike shorts from old leggings to put under her skirts as well! This is a GREAT idea!!! I love it so much! Too bad my oldest despises wearing anything jean material. I hope she grows out of that soon because it drives me bonkers! I love jeans!! What the…. 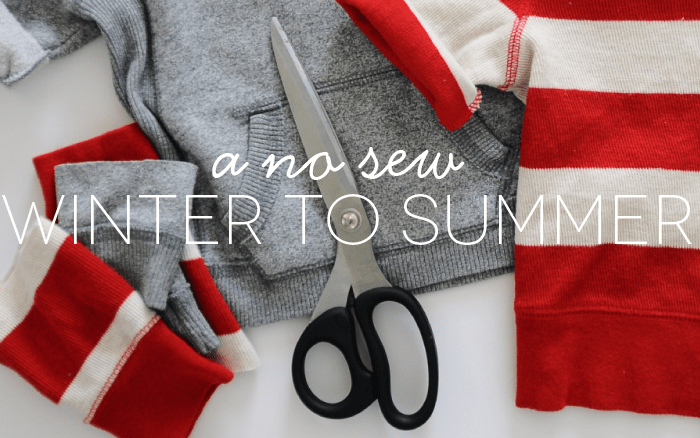 Love the cuffed sleeved sweaters….stylish transition from winter to summer and a super easy DIY! Going to tweet this today!! My toddler runs hot, so we rarely use all the hand-me-down sweatshirts we receive. Now I know what to do with them! Great post.